The Florida International University pedestrian bridge lies atop vehicles after collapsing in March 2018, killing six. An NTSB document obtained by TYT lists the incident as one of hundreds not investigated during the government shutdown. The Florida highway crash that killed seven people — including five children headed for Disney World — was not investigated due to the government shutdown, along with hundreds of other fatal accidents in which investigations were either suspended or never begun, according to an internal National Transportation Safety Board (NTSB) memo obtained by TYT. Other major incidents with suspended investigations included last year’s capsizing of a Branson, Missouri, duck boat that killed 17 people and the deadly collapse of the Florida International University pedestrian bridge. Ninety-seven accidents that occurred after the shutdown began on Dec. 22 were not investigated at all during the shutdown. Dozens of additional investigations regarding rail, pipeline, hazardous materials, marine, and highway accidents were also suspended. The NTSB memo was provided to TYT by a federal employee who requested anonymity in order to avoid retribution. The NTSB is an independent federal agency tasked with investigating all civil aviation accidents in the U.S. as well as significant railroad, highway, marine, and pipeline accidents. Excerpt of internal NTSB memo summarizing some of the impacts of the government shutdown on its investigations. 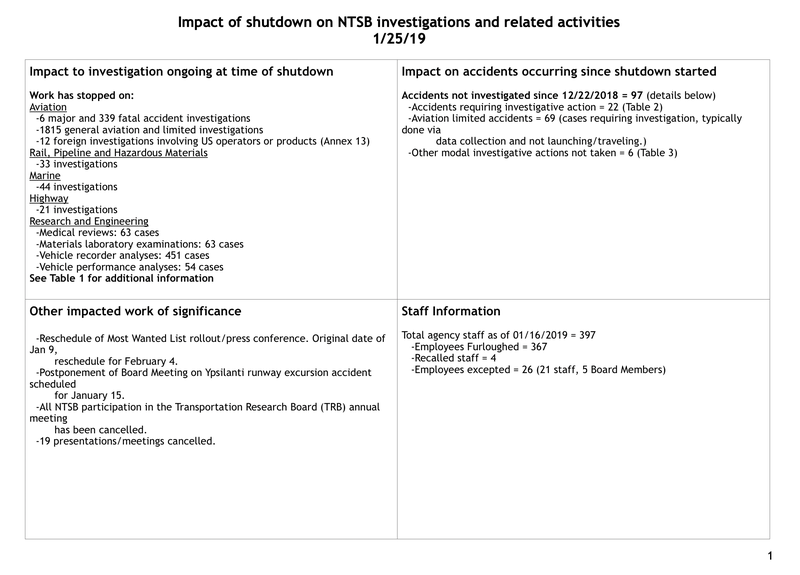 Titled “Impact of shutdown on NTSB investigations and related activities,” the memo is dated January 25, 2019, and gives details of some of the major investigations halted due to the shutdown. In addition to the domestic incidents, 12 foreign investigations involving U.S. operators or products were also suspended. The NTSB also suspended ongoing investigations of two naval collisions: the USS Fitzgerald near Japan, and the USS John S. McCain near the Straits of Singapore. The memo also shows that 367 of 397 NTSB staff were furloughed, with only four staff members being recalled and 26 excepted. Research and engineering which NTSB conducts in support of its investigations was also suspended, including 63 medical and materials laboratory cases. Several of the suspended investigations pertained to pipelines and hazardous materials accidents. For example, the memo cites a natural gas explosion in Merrimack Valley, Massachusetts, an Enbridge pipeline release of natural gas, and an “unknown” amount of diesel fuel released into a tributary. After becoming the longest government shutdown in U.S. history — by a wide margin — the shutdown was temporarily ended when President Trump signed a bill reopening the government for three weeks. Without a deal by February for a border wall, Pres. Trump has threatened to shut down the government again. Ken Klippenstein is a senior investigative reporter for TYT. He can be reached securely via Signal at 202-510-1268, Twitter @kenklippenstein or via email: [email protected].